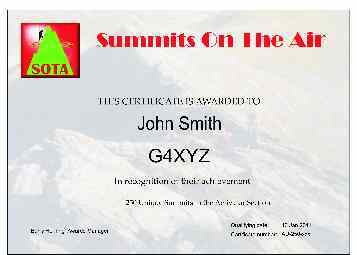 The SOTA Uniques is a count of the number of different summits in an activator's record. It is purely the number of distinct summits activated regardless of SOTA points. The SOTA Online Database keeps track of your progress. Certificates are available for the usual thresholds of 100, 250, 500 and 1000. There being over 8,000 summits in World associations at present, further thresholds of 2500 and 5000 theoretically apply at least! It is felt that this award will extend the challenge particularly for our leading activators where point scores are large and well beyond Mountain Goat, but often with less than 200 unique summits. It also addresses something that activators have been doing since the launch of the programme - counting their unique summits activated. It is possible to obtain a Mountain Goat Trophy for Activating 1000 Unique Summits; these trophies are identical to the standard MG trophy but have the word "Unique" engraved into the design.